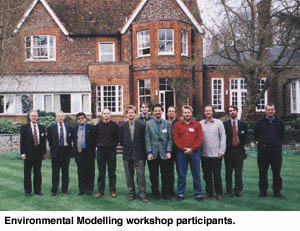 CLRC-RAL hosted the sixth workshop of the ERCIM Working Group devoted to Environmental Modelling 23-24 March 2000. It took place at the historic Coseners House by the River Thames in Abingdon. Seventeen researchers from eight institutes participated. The nine presentations addressed the topic of the application of information systems in environmental modelling. Achim Sydow from GMD Institute for Computer Architecture and Software Technology, chair of the working group, welcomed everyone and thanked Keith Jeffery for RALs hospitality. Bob Hopgood (CLRC) opened the workshop with an invited talk. He spoke with customary authority on the status of web technology, concentrating on the relevance of XML and its role in the better management, presentation and transfer of data. Three presentations on IT techniques followed: Jean-Paul Berroir and François Llirbat (INRIA) discussed workflow techniques for processing environmental data, Manolis Vavalis (FORTH) proposed the use of agents in a distributed environmental system, while Brian Read (CLRC-RAL) reviewed data exchange formats and the potential of XML for scientific data. Turning to applications, Bertram Walter (GMD-FIRST) described his success with modelling the scattering of sunlight in the atmosphere. The demanding calculations allowed realistic visualisation of phenomena such as sunsets and rainbows. Roberto San José (UPM) presented recent developments by the Madrid group for their air quality forecast model, studying the value of vertical meteorological data input. The second day of the workshop took up the theme of weather and climate modelling with reports of more local activity. Povl Frich from the UK Meteorological Office gave an overview of the problems in managing large and disparate datasets, contrasting the needs of commercial weather forecasting with those of researchers. The UGAMP (Universities Global Atmospheric Modelling Project) team were represented by Paul Berrisford (Reading University) who describing how they were tackling the problems of managing the large (200GB to 2TB) datasets produced by their gridded models. A rather different kind of modelling was presented by Simon Lambert (CLRC-RAL). He described his work with Gordon Ringland on a Management Flight Simulator. This decision support system has been applied to the better management of flood control in Bordeaux and of drinking water supply distribution. Overall it was an enjoyable Workshop, being a mix of old and new topics to interest Group members. The opportunity was taken immediately before the workshop for a working meeting on current tasks of the DECAIR project. This is an EC R&D collaboration initiated by the working group. The workshop concluded with acceptance of an invitation to hold the next one at Las Palmas in September. It will be a joint workshop with the ERCIM Database Research Group.